Enjoy these eight great recipes for using your Thanksgiving leftovers in delicious new dishes the whole family will love. If you've been reading my pre-Thanksgiving blog posts, you know The Ninj is all about the leftovers -- so much so that I shared new leftovers recipes even before Thanksgiving day arrived! Use your holiday leftovers in this recipe for deconstructed turkey (or chicken) cordon bleu pasta: quick and easy to make, lighter than you'd think. As I promised last week, I'm continuing my Thanksgiving leftovers posts this week, despite the fact that Thanksgiving hasn't even arrived yet, because I love using up the leftovers almost as much as preparing the holiday feast. So much so that a reader suggested I make two turkeys this year. 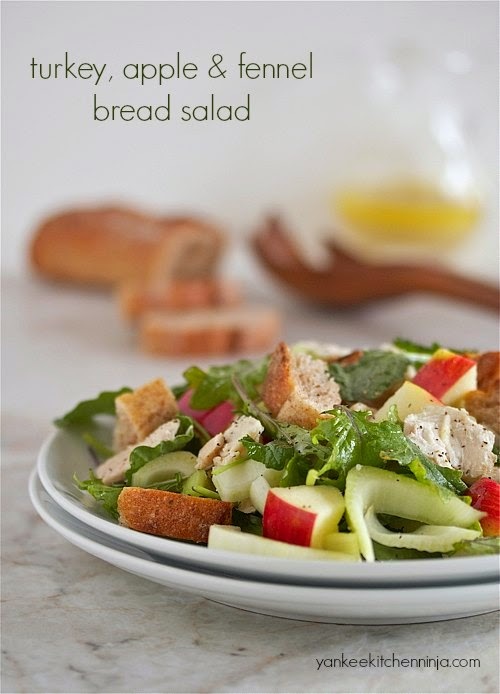 Since there are only so many turkey sandwiches that you can eat before you get sick of the stuff, I like to change it up with different kinds of dishes, such as last week's turkey, apple and fennel bread salad (I'm still eating it regularly, people -- it's that good). Another great one? 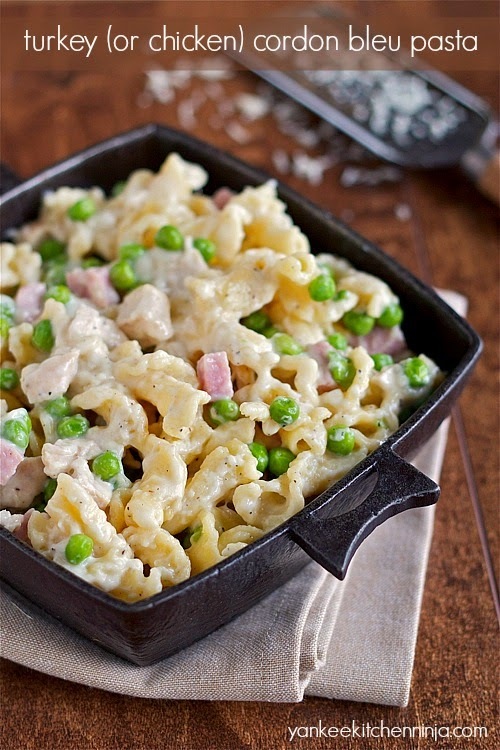 Today's turkey cordon bleu pasta. Yes, pasta! You know, because nearly all my favorite comfort foods are pasta, I swear. Now, this is not quite the same as the chicken cordon bleu you might be envisioning -- there's no pounding, no stuffing, no breading, no layering and nothing at all French-ish (even though traditional Chicken Cordon Bleu, I'm told, is all-American and has nothing to do with France or the similarly named culinary institute -- go figure). So it's more of a deconstructed chicken cordon bleu. But with turkey. And pasta. For this easy, healthy post-holiday meal salad, just toss your leftover turkey (or chicken) in a lemony vinaigrette with whole grain bread, crunchy fennel and sweet apples. So yeah, I'm going there. There's still a week to go until Thanksgiving, but I'm going to start talking about the leftovers. You will have all the ingredients you need on hand without having to risk a trip to the grocery store on Black Friday (shudder). See? It's just smart and strategic to talk leftovers the week before the holiday. Yeah, you're welcome. And if there's any doubt that Thanksgiving is just as much about the leftovers as it is about the cozy family together time spent cramming in lots of yummy food on a Thursday, let me tell you a true story. Years ago, a former co-worker friend of mine attended Thanksgiving dinner at her cousin's house. Bizarrely (because, remember, this is THANKSGIVING, The Official Day of Over Eating), there was not enough food to feed everyone at the table! (I know, right?) According to my friend, if she hadn't been a thoughtful guest and brought a large tossed salad to the dinner, she would have had nothing to eat, as she gave her son her "portion" of turkey so that at least he would have enough to eat. Oh, but wait, the story gets better. 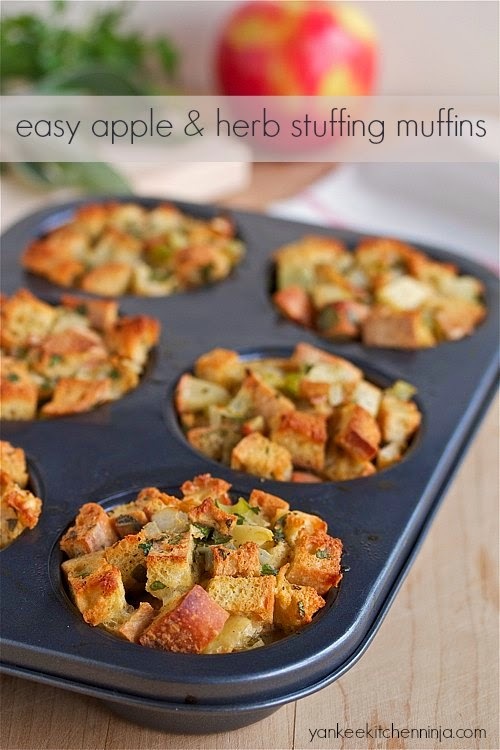 Bake these sweet-and-savory apple and herb stuffing muffins in tins for cute individual portions with lots of toasty edges. 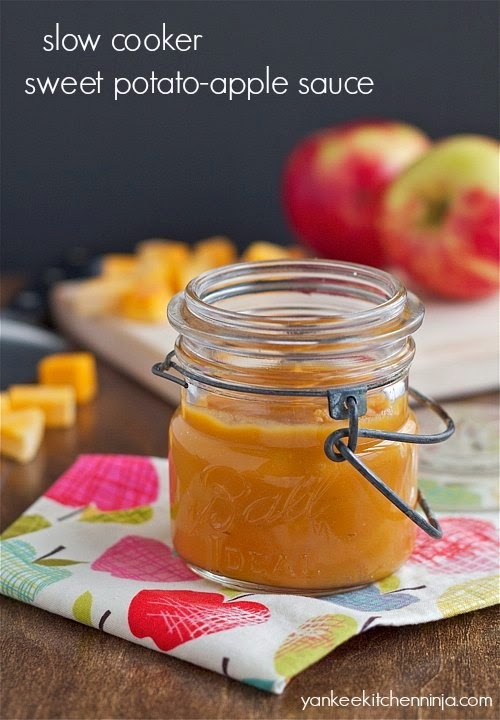 A healthy, easy holiday recipe! With Thanksgiving just around the corner, I hope you haven't finalized your menu. Because I've got a new ADORBS take on stuffing for you. Or dressing, if you call it that. I've never understood the big debate over stuffing versus dressing: potato potahto, oyster erster, whatevs. 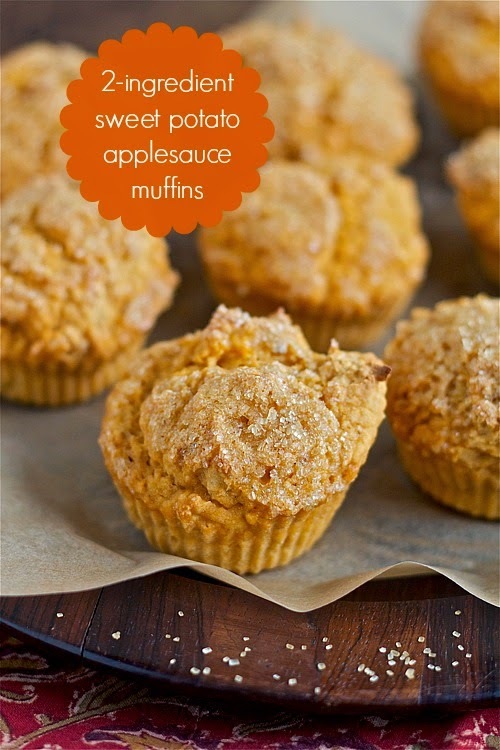 Now, I suppose these stuffing muffins aren't so new to everyone. I believe they were a big Rachel Ray-Ray thing a few years back (I can just hear her saying "stuffin' muffin" because it's rhyme-y). But they're new to me so I'm excited to talk about them. Every year for Thanksgiving, my menu is made up of some old favorites that will likely never change (deep-fried turkey, a healthy-ish sweet potato casserole) but I also like to include at least one new dish, just so it doesn't get too predictable and boring. This year, it's stuffing muffins. I mean, come on, how could I not want these on my table? They are just too freakin' adorable, with their individual-sized crunchy little selves. If you're like me and you like the crunchy edges of the stuffing the best, you're going to go cray-cray for these stuffing muffins because they are all about the crunchy edges. The whole darned thing is practically one big crunchy edge! Keep your holiday entertaining simple with this sweet-and-savory appetizer: smoky bourbon brie flatbread with fig jam and crispy prosciutto. 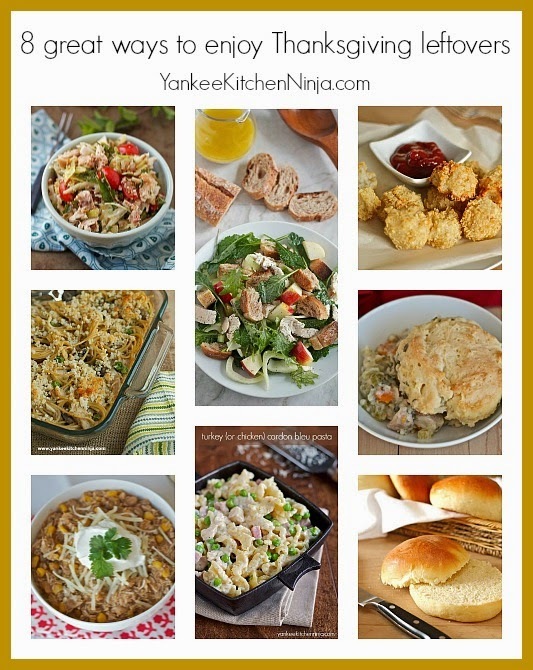 Regular readers know that The Ninj is all about quick-and-easy real-food recipes, especially for weeknight dinners. But that holds true for all my recipes -- even for holiday entertaining. 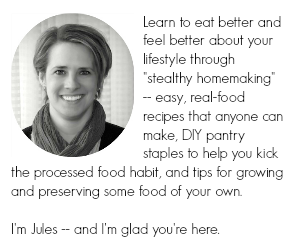 I don't know about you, but whether I'm hosting or simply attending a holiday party, I like to focus on the company, the conversation and the cocktails (not necessarily in that order, heh heh), rather than fret over the appetizer prep. 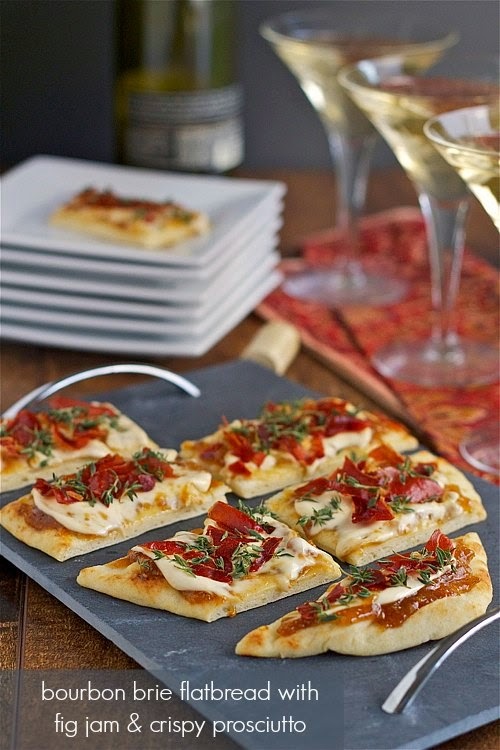 That's why I often turn to flatbreads for parties; it's easy to use a variety of spreads and toppings to turn a simple flatbread into a great appetizer pizza. Clearly the good folks at Alouette Cheese think the same way I do, since they have teamed up with Stonefire Flatbreads to share some "flavorology" this holiday season. Simply put, it's their term for the art of creating unique, simple and delicious flavor combinations using flatbreads and soft cheese spreads. What could be easier (or yummier)? Stonefire and Alouette invited me to come up with my own favorite flatbread flavorology combination: with cheese flavors like wasabi cheddar, smoky jalapeño and roasted red pepper, it was hard to choose. But of course I was pulled like a moth to a flame to the Smoky Bourbon Creme de Brie -- you know, because nothing says "holiday" to The Ninj like bourbon. Except bourbon and cheese. 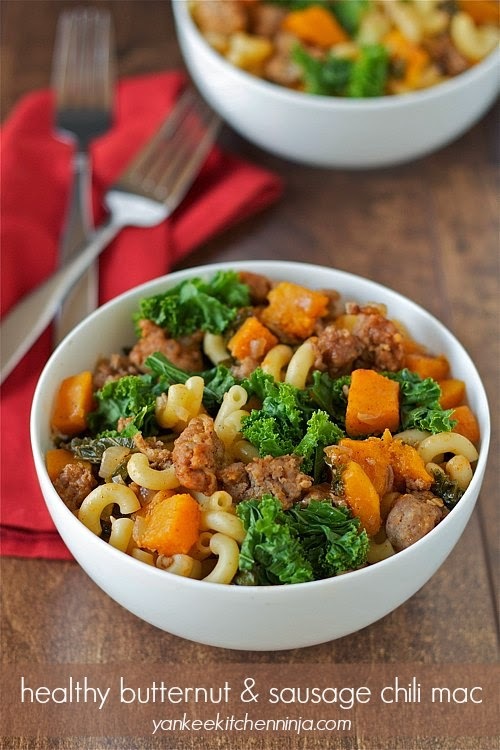 A healthy new twist on the classic chili mac dinner with butternut squash, sausage and kale, served Cincinnati-chili-style over pasta. Now that we've put the pumpkinpalooza frenzy behind us for another year, it's time to talk about other delicious fall flavors. Like butternut squash. Fortunately for Mr. Ninj and the rest of you that have "texture issues" with squash (insert eye roll here), butternut squash pairs extraordinarily well with sausage. And bacon. But that's a whole different post. Today we're focusing on butternut with sausage. I'm calling this dish "chili mac" because it's a bit hard to classify: too hearty to be simply pasta with sauce yet not saucy enough to be chili. I'm also describing it as "Cincinnati chili style", so I hope you're familiar with Cincinnati's slightly offbeat way of eating chili served over spaghetti. I have seriously fallen in love with this chili mac -- I can't stop making it and, when I do, I can't stop eating it. Have you ever made a dish that gets you really excited for leftovers the next day? This is one of those dishes.